Glassdoor serves as a jobs board, bolstered by employee reviews of previous or current employers. Individual employees (or former employees) anonymously post reviews of a company regarding its corporate culture, work practices, interview procedures, etc. Employers post open jobs, harnessing the power of their reputation as an employer to draw top talent. Through their profile, employers can stay abreast of their overall reputation as an employer, engage with reviewers, and compare themselves to competitors. Your online reputation is a huge factor in the growth and success of your business, including keeping hiring costs down and employee retention up. Take advantage of all your online reputation can do for you with 5starRocket’s complete review management tool. 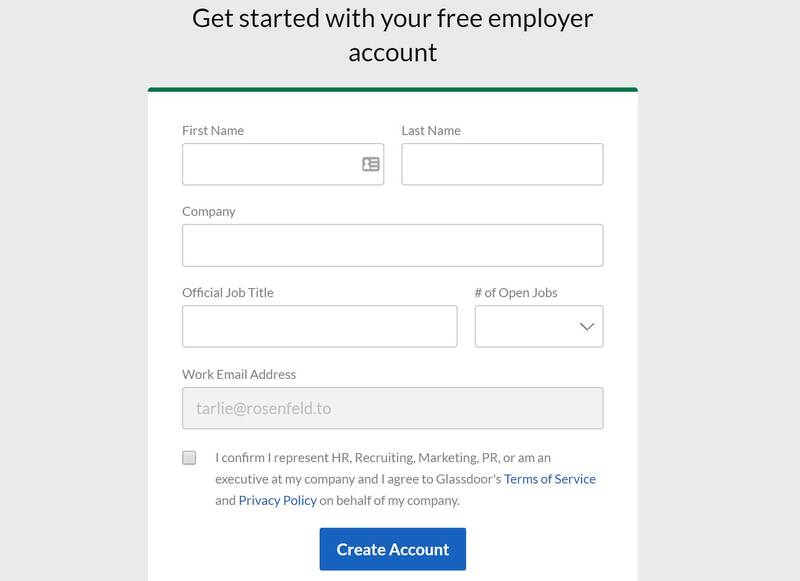 You can set up your business profile on Glassdoor with a Free Employer Account. With this account, you can update basic company information, add photos, post jobs (up to 10 at no cost), and respond to reviews. It can take up to three days for your account to be verified. Once it is verified, you will receive an email with a password that allows you to login and manage your profile. A paid account has branding and advertising features, as well as analytics. Set up your Free Employer Account here. You can navigate here by clicking the For Employers link in the upper right of the home page and choosing Unlock Employer Account in the drop-down menu. Individual reviewers are only allowed to submit one review, per employer, per year, per review type. There are four review types: company, interview, salary, benefits. Additionally, reviewers must have a Glassdoor account. From the Glassdoor homepage, reviewers simply click on Write a Review in the upper right-hand menu. If they are already signed into their account, this will be just to the right of their profile image. If not, it will be be just to the right of “Sign In.” This will take them through the process of leaving a review on your company. Final Thoughts: With over 62 million engaged job seekers on Glassdoor monthly, Glassdoor is a leading jobs board site. To maximize your hiring potential, it is important that you effectively manage your online reputation on this site. With 5starRocket’s online review management, you can get started today, and take control of your online reputation!